This homemade costume for men entered our 2015 Halloween Costume Contest. Since I first saw The Lord of the Rings: The Fellowship of the Ring (how many years ago has it been?) I have been enamored with Tolkien's world of Middle-earth. I've read and reread the books so many times and know each of the films by heart. Middle-earth has been a fantastic and influential part of my life for more than a decade. Through the films, I discovered a passion for costumes. I remember being in middle school and slaving away making a Saruman costume with my best friend (who obligingly dressed as Gandalf the White). The next year it was Haldir, then a Ringwraith. Little did I know that that passion would lead me to a career path where I get to help bring characters to life every day...through costume. I work in theatre as a costume technician. This year I decided to pick a costume which would let me explore making armor. 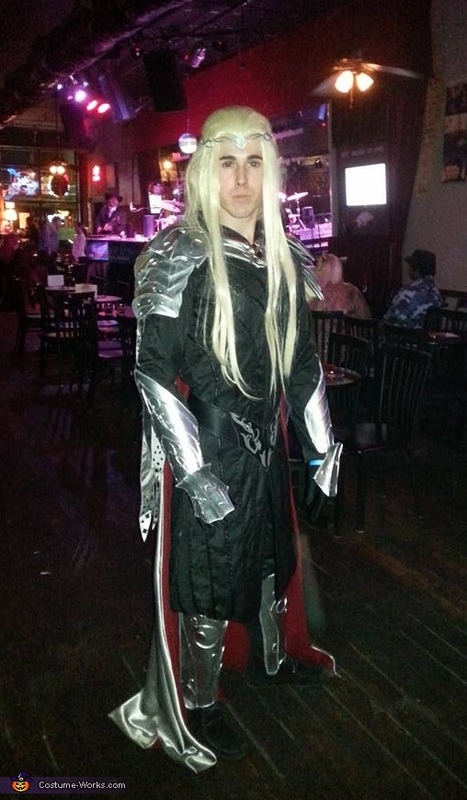 I chose Thranduil's battle look from "The Hobbit: The Battle of the Five Armies." I patterned all of the armor pieces myself (pauldrons, which are 7 separate pieces each, greaves, vambraces and the hand pieces). To build the armor, I used Worbla, a thermoplastic, for the first time and am pretty pleased with how it turned out! The shoulder pauldrons were a trick, but well worth the effort. All of the raised detailing on the armor was done with either clay (rolled into long pieces) or thin strips of craft foam. I patterned the tunic myself (as well as a solid lining), and each half of the front is made of 11 panels, individually edged in faux leather piping and stitched together. When I patterned the sleeves, I decided to add gussets to give myself more mobility. The cloak is satin with a jacorde lining, which I also patterned myself (it is a half-circle cloak with a diameter of about 10 ft along the bottom hem). I constructed the crown by cutting apart two separate tiaras and re-shaping/attaching the pieces to mimc the movie version. The stone on the forehead is made of worbla like the armor. For the wings that hang down the back, I patterned feathers (19 for each shoulder) that were cut and stitched from silver fabric backed with the same material I used for the tunic. I then glued hundreds of small black rectangles to the edges of each feather for texture and definition. I sewed the belt of faux leather and did the raised detailing in worbla. The belt fastens in back with two grommeted holes and a tie string. I did create a breastplate pattern and built the base, but decided not to finish it so that the costume wouldn't be as cumbersome trying to drive and walk around (important considerations for Halloween night!). I began making this costume in early August as a way to pass time and it grew into a project that meant (and means) a lot to me. Is it perfect? No. Was it cheap? No. I probably spent far too many hours and stressed way too much over it. However, I am proud of my work and wearing it? I felt like I was stepping into that fantastic Tolkien universe for a few hours, and that magic is priceless and worth every second of work that went into this costume. Great work! Love it if this is a contest I put my vote on this!